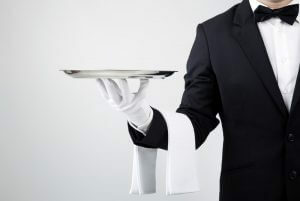 This fundraiser is likely to be hugely popular with the underclassmen at your high school: let the seniors auction themselves off to play the role of a butler for a day. The responsibilities of your butlers would be to greet their “employers” as they arrive at school, carry books around, fetch lunch, and take on any other tasks that you feel are appropriate. You'll need to find a group of volunteers willing to do this, and you can then auction them off to the highest bidder. It's important to set the rules of what a butler should and shouldn't do before the auction (no test taking, for example). You should also set out the hours that butlers will be expected to work. It's up to the employers to decide if they will be imposing a dress code or not (silly hats or t-shirts can be used as well as more formal garb). As all of the students would still be expected to attend class, butler duties will have to be suspended for these periods. You might want to round off the event with a special pizza dinner the same evening for butlers and employers alike to thank them for getting involved and raising funds.